now it is the turn of Northern Ireland. 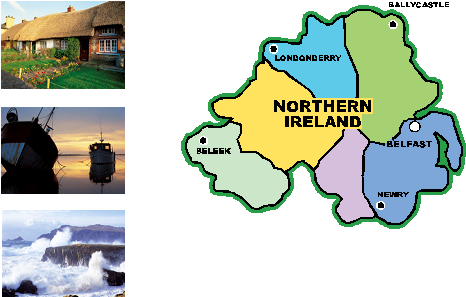 Let’s get started with Northern Ireland! Ireland as well as England, to show that it didn’t agree with the split between Ireland and Northern Ireland. These Catholics wanted to be part of the Republic of Ireland, and not of the United Kingdom. Having said this, there has been a ceasefire since 1998 and the disagreements are political. With this background information, watch the following videos about Belfast. You will see a bit about the history of Northern Ireland, as well as some of the landmarks in Belfast. Look at the pictures below and match them to the correct names below. In the video you just watched, you saw a number of flags. Using Google, search for the following flags, and draw them on the answer sheet. You haven’t finished for this lesson! Click on the link below to finish the series!